Larne will travel to Downpatrick in the next round of the Intermediate Cup after they edged out East Belfast 4-3 at Inver Park. It was a dream debut for Samuel McIlveen who helped himself to a brace, with Cliftonville loanee Ciaran Murray adding the third and fourth. In truth, the Inver Reds made it hard for themselves and they went a goal down after five minutes. A cross from Warren Pinkerton wasn’t dealt with by Kevin Bradley, allowing Steven Robb to beat Paddy Flood from 10 yards. Within a minute Larne were back on level terms. A McIlveen corner was driven into the box where it struck the outstretched of Sam McNaul. The referee immediately pointed to the spot and McIlveen drilled the resultant penalty home. McIlveen then put Larne in the driving seat on 12 minutes when he pounced on a loose ball to give the keeper no chance. With 28 minutes gone, the home side gave away a very soft equaliser. The ball broke to Pinkerton who should have been closed down and from all of 30 yards his shot sailed over Flood into the net. Pinkerton almost put the visitors ahead moments later when he was allowed too much space but sent his low shot wide of the mark. Five minutes after the break Stuart McMullan was unlucky to see his firm header strike the crossbar. With 12 minutes left a great ball from Eoin Gillan sent Murray away and, in his usual style, he nipped in over the keeper into the net. But the lead was to last only five minutes when poor defending allowed sub William Gill to level things up again. With two minutes left, sub Guillame Keke’s weighted pass found Murray and he sent Larne through to round three with a deft of finish. 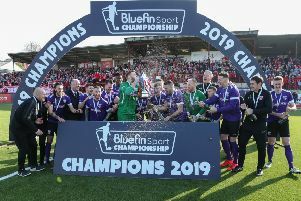 Larne: Flood, Bradley, McGonnell, McClean, McMullan, E. Gillan, McIlveen, Donnelly (G. Gillan 52), Maguire (Keke 72), McCabe (Murray 52), Robinson. Subs not used: McGrandless, Irvine. EAST BELFAST: Halliday, Belshaw, Davison, Naul, McCaughan, Beattie, Wilson, Cousins, Wright, Robb, Pinkerton. Subs: Holmes, Gill, Laverty, Egerton, Curtis.